Skip MacCarty, (Andrews University) defends the seventh-day view, which argues the fourth commandment is a moral law of God requiring us to keep the seventh day, Saturday, holy. It must therefore remain the day of rest and worship for Christians. Joseph A. Pipa, (Greenville Presbyterian Theological Seminary) backs the Christian Sabbath view. He reasons that ever since the resurrection of Christ, the one day in seven to be kept holy is Sunday, the first day of the week. Charles R Arand, (Concordia Seminary) upholds the Lutheran view that the Sabbath commandment was given to Jews alone and does not concern Christians. Rest and worship are still required but are not tied to a particular day. Craig L. Blomberg, (Denver Seminary) supports the Fulfillment view: since Christ has brought the true Sabbath rest into the present, the Sabbath commands of the Old Testament are no longer binding on believers. Christopher John Donato, is senior associate editor of Tabletalk magazine, a devotional reader that exists to help explain important doctrines and events that shape the church while encouraging people to reflect the image of Christ in both word and deed. He lives in Longwood, Florida. - Publisher Perspectives on the Sabbath presents in point-counterpoint form the four most common views of the Sabbath commandment that have arisen throughout church history, representing the major positions held among Christians today. Skip MacCarty (Andrews University) defends the Seventh-day view which argues the fourth commandment is a moral law of God requiring us to keep the seventh day (Saturday) holy. It must therefore remain the day of rest and worship for Christians.Jospeh A Pipa (Greenville Presbyterian Theological Seminary) backs the Christian Sabbath view which reasons that ever since the resurrection of Christ, the one day in seven to be kept holy is the first day of the week.Craig L. Blomberg (Denver Seminary) supports the Fulfillment view which says that since Christ has brought the true Sabbath rest into the present, the Sabbath commands of the Old Testament are no longer binding on believers.Charles P. Arand (Concordia Seminary) upholds the Lutheran view that the Sabbath commandment was given to Jews alone and does not concern Christians. Rest and worship are still required but not tied to a particular day. 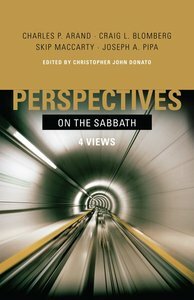 About "Perspectives on the Sabbath"
Perspectives on the Sabbath presents in point-counterpoint form the four most common views of the Sabbath commandment that have arisen throughout church history, representing the major positions held among Christians today. Skip MacCarty (Andrews University) defends the Seventh-day view which argues the fourth commandment is a moral law of God requiring us to keep the seventh day (Saturday) holy. It must therefore remain the day of rest and worship for Christians.Jospeh A Pipa (Greenville Presbyterian Theological Seminary) backs the Christian Sabbath view which reasons that ever since the resurrection of Christ, the one day in seven to be kept holy is the first day of the week.Craig L. Blomberg (Denver Seminary) supports the Fulfillment view which says that since Christ has brought the true Sabbath rest into the present, the Sabbath commands of the Old Testament are no longer binding on believers.Charles P. Arand (Concordia Seminary) upholds the Lutheran view that the Sabbath commandment was given to Jews alone and does not concern Christians. Rest and worship are still required but not tied to a particular day.